The year 1944 saw director Billy Wilder’s biggest success up to that point– the hardboiled noir thriller DOUBLE INDEMNITY. Of all the film’s Oscar nominations, none was perhaps as hard-fought as his collaboration with popular crime novelist Raymond Chandler on the screenplay. It’s a minor miracle that they were even able to finish the script at all, given their reportedly antagonistic working relationship. Chandler was a recovering alcoholic, and the stress of writing DOUBLE INDEMNITY with Wilder was enough to drive him back to the bottle. This apparently hit a nerve with Wilder, who was reminded of the episode while reading Charles L. Jackson’s novel “The Lost Weekend” during a cross-country train trip later that same year. In the book’s story of a crazed alcoholic hitting rock bottom with his addiction, Wilder saw an opportunity to explore his own experience with Chandler’s relapse– or, in his words, a chance to “explain Chandler to himself”. After he convinced Paramount head Buddy de Sylvia to secure the film rights for him, Wilder and his longtime writing partner Charles Brackett set to work adapting Jackson’s book to screen. Wilder’s first whack at a straight-faced drama, THE LOST WEEKEND (1945) would eventually prove to be an eventful work in the director’s career, and would finally bring him the critical acclaim and awards recognition that had thus far eluded him. 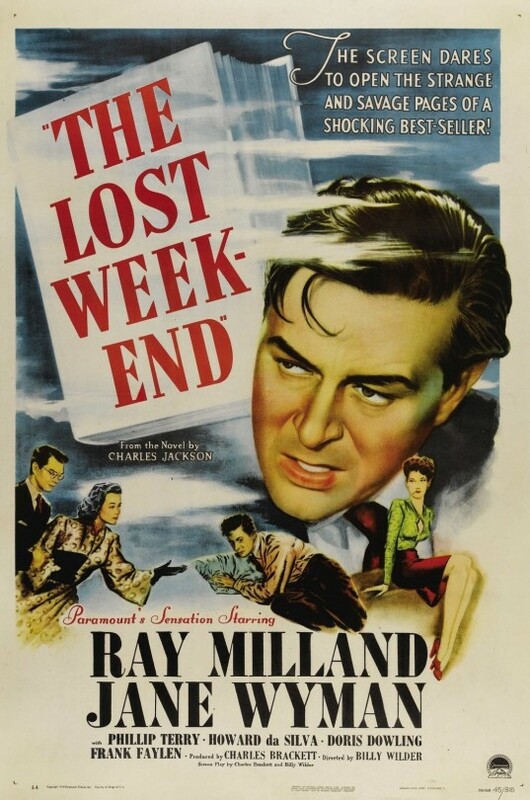 THE LOST WEEKEND recounts a nightmarish, booze-soaked weekend in the life of Don Birnam (Ray Milland), a man who would be America’s next great novelist if only he could manage to stop himself from getting blackout drunk every time he sat down to write. His addiction is growing increasingly apparent to those around him, including his brother Wick (Phillip Terry) and his girlfriend Helen (Jane Wyman). When Wick arranges for a weekend writing retreat for the both of them outside of town, Don manages to give him the slip and subsequently spends the entire weekend plunging deeper and deeper towards the bottom of a rye bottle. Don knows he’s helpless against his addiction, but will he allow others to help him before it’s too late? Thanks to the restrictive Hays Code, the film’s attempts at authentically depicting the horrors of alcoholism are undermined by an earnestly hamfisted, old-fashioned Hollywood approach– complete with the unrealistic “Happy Ending” in which Don finally cures himself of his addiction once and for all by sheer power of will. That being said, THE LOST WEEKEND is nonetheless a powerful portrait of addiction, and served to open many audience members’ eyes to the true nature of the disease when it was released. Ray Milland– who previously headlined for Wilder in 1942’s THE MAJOR AND THE MINOR– plays the character of Don Birnam as something of a Jekyll and Hyde type, alternating between a clean-cut, cultured, and respectable man when sober, and a tempestuously volatile drunk with a crazed glint in his eyes. Previously known for his roles in romantic comedies and adventure films, Milland’s somewhat over-the-top performance here is a drastic departure for him. He throws himself headlong into the role, his risk rewarded with an Oscar for Best Actor. As Don’s girlfriend Helen St. James, Jane Wyman can’t help but be pigeonholed into the “glamorous, feminine saving-grace” archetype that pervades films from this era. That being said, she turns in an admirable performance that hits all the right notes. Phillip Terry is affecting as Wick Birnam, Don’s bookish, put-together brother who is quickly becoming fed-up with Don’s unwillingness to seek help. Howard Da Silva plays a stern and vindictive bartender named Nat who somehow becomes one of Don’s confidantes. Doris Dowling, who at the time was reportedly Wilder’s mistress, gives the minor character of Gloria a darkly seductive femme fatale flair that’s reminiscent of Barbara Stanwyck’s icy flirtations in DOUBLE INDEMNITY. Out of all the members of THE LOST WEEKEND’s cast, however, the most notable in regards to Wilder’s own personal life doesn’t even appear onscreen. A young woman named Audrey Young was cast as a nonspeaking coat check girl, but she nevertheless managed to catch Wilder’s eye during the shoot. Young would go on to become Wilder’s second wife only a few years after his divorce from his first, Judith Coppicus, in 1946. THE LOST WEEKEND marks Wilder’s fourth tour of duty with his regular cinematographer John Seitz, who by now has become well-versed in the director’s particularly utilitarian and minimalist aesthetic. Shot in the era’s standard 1.37:1 square aspect ratio, the 35mm black-and-white film frame boasts a glamorous, polished touch indicative of the “Silver Screen” era while alluding to the expressionist chiaroscuro that marked DOUBLE INDEMNITY (most apparent in the hospital sequence). In fact, these dramatic shadows seem to be creeping up from the edges of the frame, reflecting the time’s growing sense of moral ambiguity and collective loss of innocence following the close of World War 2. THE LOST WEEKEND sees Wilder further build on other stylistic conceits he’d been exploring in DOUBLE INDEMNITY and FIVE GRAVES TO CAIRO (1943), like dramatic deep-focus foreground/background juxtapositions (seen most notably during a phone booth scene set in a hotel lobby), or virtuoso camera movements that aren’t always motivated by character blocking (like the Hitchcock-ian opening shot that pans across the Manhattan skyline before swooping into Don’s apartment, or the dramatic push-in to an extreme close-up of a glass of rye). While these little moments of visual flair are indicative of Wilder becoming more secure in his technical proficiency, they are few and far between. One the whole, Wilder defers to his tried-and-true 2 shots masters, complementing them with calculating close-ups strategically placed by his editor Doane Harrison. Miklos Rozsa, who scored Wilder’s previous two films, returns to compose the music for THE LOST WEEKEND. Typical of scores from the time, Rozsa employs a bombastic, sweeping orchestral sound with several romantic overtures that hammer home the high drama on display. This wouldn’t seem to suggest that THE LOST WEEKEND’s score was anything particularly exciting or groundbreaking– but that’s exactly what it was, thanks to Rozsa’s pioneering use of the theremin, one of the earliest instruments of the electronic variety. The creepy, undulating sound of the theremin was used to score the nightmarish bender sequences, and its otherworldly sound would later become the aural signature of midcentury sci-fi B-films and cheesy Halloween decorations. Interestingly enough, THE LOST WEEKEND was initially released to audiences without a musical score, a version which failed to generate a positive response. It was only after Rozsa’s score was added that the film found success (1), a testament to the transcendent quality that music can have on an image. Rosza’s work here would be nominated for Best Score at the Oscars, and while it ultimately didn’t win, Rosza could hardly have been disappointed considering he lost to himself for his work on Alfred Hitchcock’s SPELLBOUND. THE LOST WEEKEND continues Wilder’s fascination with risque or otherwise-inappropriate content, further solidifying his artistic legacy as a filmmaker who challenged the pearl-clutching status quo and widened the range of stories that could be told in American mass media. This aspect of his career is arguably attributable to his focus on social issues directly pertaining to the middle class (aka cinema’s largest consumer group). While alcoholism of course affects people from all walks of life, THE LOST WEEKEND’s exploration of the disease as it affects an upwardly-mobile white-collar worker helped to frame the conversation as an “everyman” issue that could happen to anybody. The film’s study of alcoholism hit a particular chord with American servicemen, who were just returning home from combat overseas and had turned to the comforts of alcohol to battle their undiagnosed PTSD. Understandably, there were interest groups that didn’t want THE LOST WEEKEND to ever see the light of day. Paramount received enormous pressure on both sides from alcohol industry and temperance lobbyists, so the studio hedged its bets by initially putting out the film as a limited release. However, the reviews were so positive that they were compelled to ignore external pressures in favor of a wide release. This proved to be a smart move, as THE LOST WEEKEND went on to be a great commercial success– propelled in large part by the aforementioned military audience who rewarded the film’s recognition of their plight by turning out in droves. 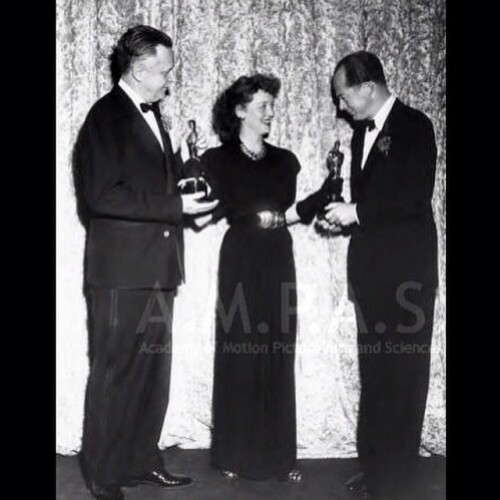 Having endured the bitter sting of Oscar defeat with DOUBLE INDEMNITY, Wilder rode a veritable tsunami of praise all the way back to Grauman’s Chinese Theatre only a year later, sweeping up gold statues for Best Direction, Best Screenplay, and Best Picture in the ensuing riptide. Normally, this would be the career highlight of any working director… but fate had far greater plans in store for Wilder. The crucial, artistically-validating wins for THE LOST WEEKEND would establish a firm footing for such a strong body of iconic works that his wins here look like a mere footnote by comparison. Whereas his previous works up to this point had cultivated a reputation for Wilder as an actor’s director who emphasized writing and dialogue over visual spectacle, THE LOST WEEKEND shows Wilder comfortably settling into the height of his powers as an acknowledged master of the form. THE LOST WEEKEND is currently available on standard definition DVD via Universal. Via Wikipedia: “MIKLÓS RÓZSA”. International Film Music Critics Association.